Dr. Kate Silvester, a renowned UK expert in clinical systems improvement, discusses how clinicians can learn lessons about productivity from a wide range of professional fields outside healthcare. Managing patient flow in your clinic sessions is all about understanding the true nature of the problems you’re facing and then using established engineering principles to tackle them head on. Your career path has taken an extremely different route from that of most physicians. What insights has your experience in manufacturing given you when it comes to healthcare? A profound understanding of process, operations and supply chain design and management. In other words, production line engineering. This applies to the clinical process that we put our patients through: the sequence of tasks by which we transform a sick patient into a well patient: presentation, history and examination, differential diagnosis, diagnostic tests, diagnosis, prognosis and plan, implementation of the plan, review, prognosis, discharge and maintenance. Then having understood this sequence of tasks and who does what with what and when, then we can design the supporting processes by which we deliver the skills, information supplies, equipment and money to deliver each of the tasks on time, every time in full at a cost the patient, in our case, the taxpayer can afford. 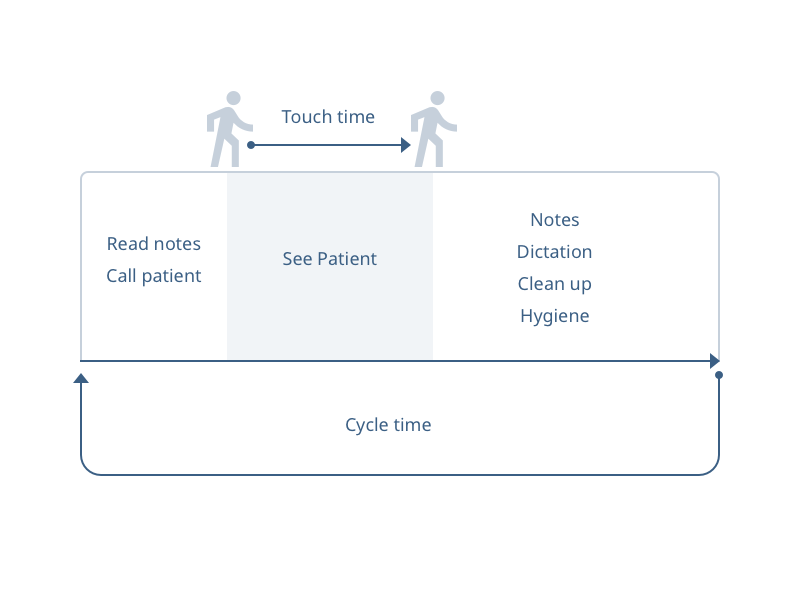 In brief, what are the main principles behind the most effective way of managing patient flow? Understand the demand: number of patients requesting a service and the day to day variation in demand. Understand the sequence of tasks involved in the clinical process(es) to deliver the service (s) they require. This is sometimes referred to as the case mix. Understand the cycle time required at each resource, and the constraint resource, the rate limiting step which will govern the flow of the entire process. The cycle time is the time a resource starts on one patient to when they are ready to start the same task on the next patient. It includes the touch time (when the patient is in front of the resource) and all the set-up, clear down and administrative tasks such as setting up equipment, cleaning the room, writing the notes, etc. i.e. all the work involved in performing and completing the task for each patient. if you plan a service to meet the average demand or workload, you will always develop a backlog, or queue. So, we need to understand the ‘flaw of averages’ and how to mitigate it. That is something that the NHS has never grasped. What kind of hurdles are faced by staff when they first encounter your way of managing patient flow, and how do you help them overcome these issues? Most staff are experts at their tasks within the clinical process but they are physically and mentally constrained by the organisation silo in which they sit. E.g. GP, radiology, A&E, ambulance, social services etc. So, the first task is to ask them to task the patient’s view of the system in which they work and physically map the process which often the patient is the only one to see. This is always revolutionary for 2 reasons: the staff have no idea what really goes on for their patients and they get to meet and appreciate their colleagues in other silos (or even in their own departments) on whom they have relied for years and years. This is a very emotional experience as it is very difficult to blame someone you now know. This requires the staff, particularly senior managers and clinicians, to understand that it is the system, not the people, who are the problem. The next teaching task is to introduce them to system science – the design of operations design and management. The staff with a scientific background (doctors, radiographers, lab scientists, physiotherapist etc.) have no problems with this: they recognise the process principles from physiology and biochemistry. we have to create multidisciplinary teams in which we have a good balance between the scientists and those with the people skills. The data is hidden away in databases that are governed by data analysts with no contact with the clinical process and who struggle to interpret and retrieve the data correctly. Doctors and academics are only taught a branch of static statistics by which we can compare populations. This is a real handicap as we need dynamic statistics, statistical process control, to understand the performance of a dynamic system over time. So even though clinicians use dynamic records of a system over time to diagnose and monitor every patient’s physiology, they are unaware that there is a whole branch of statistics for doing this. So, they resort to the only tool they know and use comparative statistics. The recent paper comparing telephone consultation with face to face consultations is a really example of this: the academic team ‘lumped’ all the GP telephone consultation systems into one group where the dynamic data plots showed that this was not one homogeneous group. This comes as a real shock, particularly to eminent professors. Again, they struggle to bridge the gap between their experience and this reality and then an interesting dynamic comes into play as they ‘suppress’ any exposure of this gap: Galileo had the same problem!